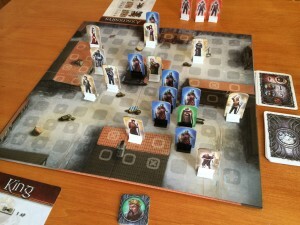 King and Assassins is an asymmetric, 2-player game where the King player controls the king and his knights; whereas, the Assassin player controls the villagers in the town of which 3 are assassins who are trying to kill the king. The winners of the Spiel des Jahres and the Kennerspiel des Jahres were announced yesterday. The winners were Camel Up and Istanbul. It’s always interesting to try and work out the winners because I know what I like the most (and would vote for) is definitely not the same as what I think will be voted for by the jury, because the SdJ awards are for a more general German game-playing audience (and not a more serious gamer audience). If it was my choice, it would have been Splendor for the main prize as it’s the one I enjoy the most; however, I guessed Camel Up would be picked as the winner as it’s a more accessible game for a wider audience and the card pyramid offers an appealing, physical element. So, Camel Up winning wasn’t a surprise to me. The Kennerspiel was a hard one to call – I had it down to Istanbul and Rokoko. I really like Istanbul but I wondered if it was slightly too light for the Kennerspiel, even in the context of the SdJs. However, Rokoko was maybe too far the other way as it’s a tense game with a lot of elements to balance and time correctly. So, I was happy with either of those being the winner. I thought this year’s SdJ was a good one as I found all the games to be good quality – whereas, some years I scratch my head wondering how some of the games were picked. In fact, it’s the first year I’ve found myself playing all the nominees, and playing some of them quite a lot. I still think Lewis & Clark should have been at least a recommendation though (if not a nominee) for the Kennerspiel. Links to my reviews of all the SdJ nominees, winners and some recommendations are on my SdJ 2014 page.